Ever had a belgian chocolate? Creamy, intense... yet simple flavor. Join me in exploring a home decorated in the Belgian style. 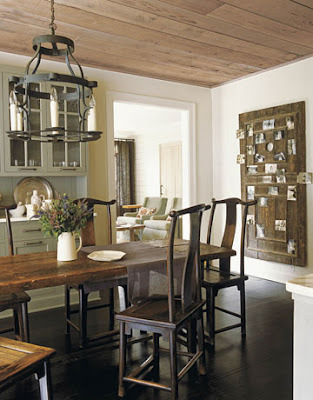 Ancient French doors open into a custom media cabinet and provide the room's gorgeous focus. a craggy mirror. Large antique lantern. Chocolate colored linen slipcovers... Yum. Another simple, single light. Those floors! The headboard is an old antique door. Tufted Earl chairs. ...Bathroom is clean and fresh...simple. The sunroom...a place to just be. 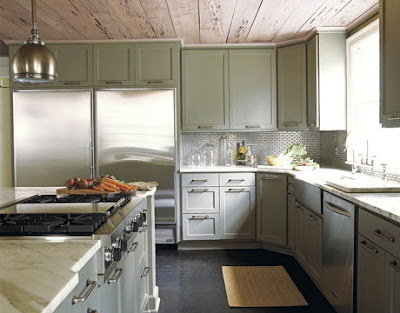 The kitchen...pecky cypress ceiling, unstained. Chinese chairs pulled up to a worn farm table. Another antique door on the wall...This time holding family photos. Industrial looking light fixtures and back splash. I would so be on it! Okay. I know I've said this before, but this was my FAVORITE post ever! Everything about that first room, the chunky candles, the tufted chairs, and THAT KITCHEN! To. die. for! Love it all. Gorgeous photos! I am looking for a chaise just like the ones in the sunroom :-) And the antique door/headboard is beautiful! Oh my goodness! I love these photos. 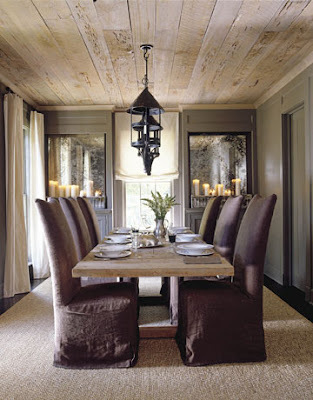 So rustic but yet absolutely elegant in style. Thank you for the yummy eye-candy and thanks for poppin' by my place for a visit. Oh my goodness..those old French doors are amazing. And I love the dining room with the chocolate slipcovered chairs! 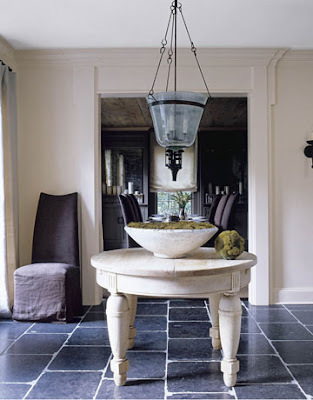 Simple and beautiful decor yet completely modern with loads of warmth - love it. love the Belgian look = I die! All gorgeous images. I could live in any of these rooms and be soooo happy! Love that kitchen. That ceiling and floor make it warm and inviting. Linda- I love the door, the rectangle dining table etc... The best part about this Belgian chocolate there is no calories!! Thanks for visiting my blog and for sharing! So beautiful! Do I recognize a Nancy Braithwaite designed room included here?? The wooden ceiling in this place is amazing. That is just beautiful. I love the feel of those rooms. I'm pretty sure I could live there! 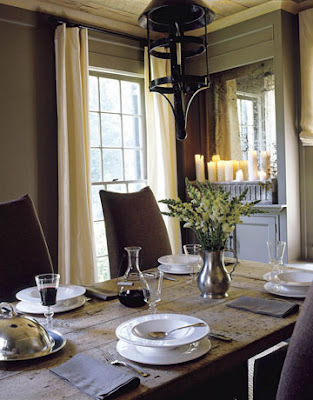 Love it, so country, yet elegant. This month's issue of House Beautiful has the Barefoot Contessa's new barn with Belgium design-it's on the cover, it is beautiful!! Check it out! This home is absolutely amazing! I completely and utterly love it, the dining room lantern was so pretty. Pam...The designer was Pam Douglass. Thanks guys....It is gorgeous, isn't it! Ok. I want that couch in the first picture. It's fabulous!!! Absolutely love it! But, makes me crave some chocolate and I want it NOW! Thanks, alot, Linda! Very simple and chic images today! Hi - me again! yes - that was my breakfast room in the first picture. I bought that table last year and it's like my favorite thing in my house!! thanks for the comment !!!! Linda...I have been tagged and want to share with you! lol! Come to my blog to see the rules if you would like to play. This is one of my favorite homes. I love Belgian design! I am trying to incorporate more of it in my home.